Here are tonight’s plays for the third and final night of the Letterkenny One Act Festival. First play begins at 7pm. Tickets available on the door. Synopsis: The play dramatizes the life of Tom Clarke, the public and private man. It covers the time span from 1830 when his father James was born, to Clarke’s execution in 1916. During the performance we meet Clarke, his wife Kathleen, Winifred Carney James Connolly’s secretary, McKenzie-Booth a British medical officer, Patrick Pearse, a British recruit, Thomas Junior, and a member of Cumann na mBan. It is betimes heartbreakingly sad but peppered with comedy. Lucan Dramatic Society was founded in 1957 by Rev. James Loughran and Michael Gannon as St. Mary’s Dramatic Society and is now more commonly referred to as Lucan Drama. With previous circuit flirtations, still evident on trophies, interest in competition was re-ignited in 2013 and Lucan have entered a One Act Festival every year since. This Year they bring us SUBTRACTION by Kevin McFillen directed by Vincent Casey and starring Elaine Butler and George Hogan. It is George’s first play with Lucan Drama. Walter and Melanie attempt to balance the universal equation in this conversational drama about loss, memory and the loss of memory. Synopsis: Whilst waiting to hire a cabin cruiser on the River Shannon, two apparent strangers play an elaborate game, which involves re-enacting a marriage on the rocks with the other people in the reception area as supporting cast. But all is not what it seems. Gunpowder Productions was founded in 2006 by a group of friends who had a deep interest in drama. The name of the company comes from a local gunpowder mill in Ballincollig. The group is lucky to have a broad range of talents within the group. NB: There will be a 15-minute interval between each play. Eavan and Riona Hennessey and Marc Mc Closkey will provide musical entertainment while the adjudicator is considering the awards. Here are tonight’s plays for the opening night of the Letterkenny One Act Festival. First play begins at 7.30pm. Tickets available on the door. Synopsis: Dark secrets hidden in the grey mists of time are reluctantly revealed in this black comedy. Set in a small village in 1880’s Russia, Anya and Sonia are goaded into recollecting some things they’d rather forget from their earlier years, upon the bizarre discovery of an empty coffin in Anya’s lodgings. Rush Dramatic Society was founded in 1927, having its roots in the Gaelic League. It has been in continuous activity ever since. RDS built its own home The Millbank Theatre which opened in 1988 . RDS produce five shows each year and The Millbank Theatre is home to the Annual Rush Drama Festival. Synopsis:- Ray Mullins is a homeless man living on a bench in a Dublin park. But how can a man who had a career, a beautiful house, wife and successful sporting life, fall from grace? The play follows the life of Ray through a series of his memories and events in the park. He engages the audience and makes us all look at how we perceive the great illness of Irish society – Homelessness. Tadhg An Astna was set up in 2012 and is based in Clonakilty, Co. Cork. The group specialises in writing and producing its own work. This is the first year the group is performing on the one act circuit. ‘Homeless’ won an award for ‘audience best play’ in a festival in Coolgrayney last year. Synopsis: The play takes place in the backyard of a small-town Texas bar in the 1970s. Roy, a brawny macho type is back from Vietnam and boasts of his military and amorous exploits to his brother Ray, a simple small-town boy who adores his brother. Roy loves three things; his country, his young wife and his 1959 pink Thunderbird convertible. With the arrival of Cletis, a gormless store-owner in town who also hero-worships Roy, the underpinnings of Roy’s world and inflated sense of himself begin to unravel as both Cletis and Ray have secrets that leave Roy stunned and suitably chastened. Ballina Drama Society is 70 years old. They are on record as having produced at least one play every year since 1946! BDS has been the corner-stone of drama in north Mayo, producing a variety of genres in drama from Irish plays to farce, to English comedy of errors. Because of this longevity, they have had hundreds of members on their books, some of whom are second generation. As well as producing quality drama, they contribute annually to local charities. NB: there will be a 15 minute interval between each play. 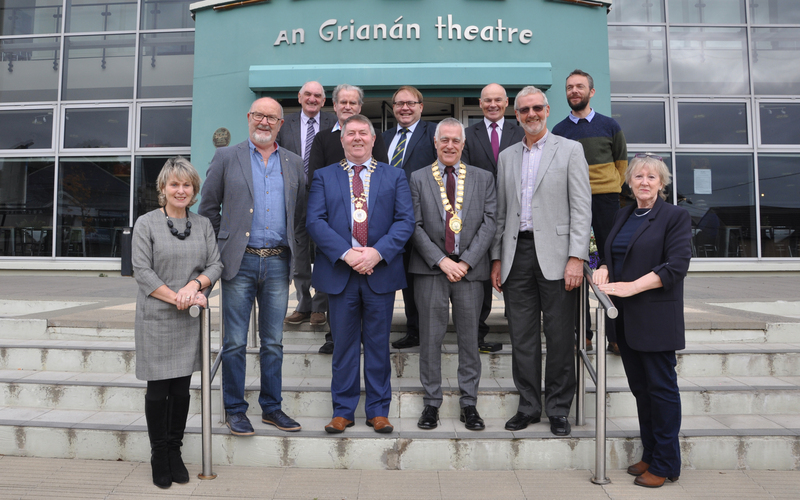 The organisers of the Letterkenny One Act Drama Festival have another great line up of amateur drama companies from across the island of Ireland competing this week. Tickets for each night are €8/€6 or save some money by becoming a Friend of the Festival – it’s €15 for an individual or €30 for a couple and entitles you to complementary tickets for each night of the festival – contact the box office on 0749120777 for further information. On Thursday night competing in the Confined competition we have Ballyshannon company Dark Daughter Productions with Jean McConnell’s Deckchairs 3 – Cruise Missile. When Janet embarks on her first cruise, she finds herself overwhelmed by the array of delights on offer. However, there is a fellow passenger who is only too willing to be her guide and mentor. It is the flamboyant Goldie, who is familiar with all the wrinkles and most of the crew. But her instant friendship is something of a mixed blessing. Also competing in the Confined section are the Phoenix Players from Tubbercurry who are presenting The Hitman by JCW Brook. The husband of an elderly unhappy married couple decides to get rid of his wife—but does it all work out?! Competing in the Open competition are Belfast’s Belvoir Players. In The Spelling Mistakes by Eugene Labiche, Caboussat is standing for election as President of the local Agricultural Committee, but Caboussat cannot spell and is only able to hide this deep flaw by allowing his daughter Blanche to write out, and correct, his speeches. The plot thickens when Poitrinas arrives, not only in search of Ancient Roman remains, but also to seek the hand of Blanche for his son. On Friday we have Model Box Productions from Wicklow with Peter Tolan’s Stay Carl Stay. Set in New York, this is the story of a mild mannered woman dominated by her boyfriend, who on the advice of a therapist adopts a dog, Carl. Life gets interesting when Carl learns to talk and dance! They are competing in the Confined group. Newtowncashel Drama Club are from Co Longford and are presenting Cliff’s Edge by Paul Beard. A suicidal failed actor, a maniacally depressed pub landlord and a schizophrenic passerby are the characters in this blackest of comedies. Set on the cliff top at Beachy Head, this carefully researched piece of modern theatre has received critical acclaim since its showcase in Edinburgh and subsequent productions in Chicago, Madrid, Stockholm, Melbourne and Prague. Newtownabbey’s Theatre 3 present Dario Fo’s The Virtuous Burglar in the Open section. A burglar is discovered when the owner of the flat returns unexpectedly with his mistress. When the owner’s wife arrives, the burglar is forced to pretend that the mistress is his wife. Other spouses and lovers appear and the burglar – apparently the only one not having an affair – is forced into pretending to have multiple wives. Then his own wife arrives! On Saturday we have two plays competing in the Open section – the Bradán Players from Dublin and the Bangor Drama Group from Co Down. The Bradan Players are producing Vaclev Havel’s Unveiling, a three hander which sees Vanek call to the house of his friends Vera and Michael and the unfolding conversation which drives the course of the evening. The Bangor Drama Group are staging Sharkey by Michael Levers. Sharkey has a lot to come to terms with. Looking for answers, he returns to his old church and to the minister there, who is his ex-partner, Lavinia. What happens in the church takes Sharkey to a world beyond his dreams, because there is a story about life and death that some people have forgotten. Local group the Letterkenny Music and Drama Group are performing out of competition with their play Love in a Glass Jar by Nancy Harris. Eve and Patrick are two strangers who get chatting on a dating website and agree to a face to face meeting in a hotel room. Patrick is in his forties and separated from his wife. Eve is a successful single woman in her thirties and is tired of being let down by love. She wants a child and wants to know the father, but she doesn’t want a man in her life. The dynamic between them shifts and flows with comic and painful results as Eve and Patrick both struggle to come to terms with their loneliness and each other. Letterkenny One Act Festival 2014, Thurs 13 to Sat 15 Nov at 7.30pm – Book now!